Dr. J.M. Kenoyer is one of the world's leading authorities on the ancient Indus civilization. A Professor of Anthropology at the University of Wisconsin Madison, he has been excavating with the Harappa Archaeological Research Project (HARP) at the ancient Indus city of Harappa for since 1986. He is currently co-director of the project. His most well-known book is Ancient Cities of the Indus Valley (Oxford, 1998). He was also Curator of the Great Cities, Small Treasures: The Ancient World of the Indus Valley exhibit in the US in 1999. His most recent book, co-authored with Kimberly Heuston for children, is The Ancient South Asian World (Oxford 2005). Dr. Kenoyer was born and raised in India. He attended Woodstock School in northern India were he developed a keen interest in the ancient history, archaeology and cultures of South Asia. He did his B.A., M.A. and Ph.D (1983) from the University of California at Berkeley. 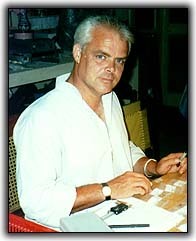 He was a student of the late George F. Dales with whom he co-authored Excavations at Mohenjo-daro, Pakistan: The Pottery. He speaks several South Asian languages fluently and has been involved in a variety of archaeological and ethnographic projects in Pakistan and India since 1974. His particular interests include the origins of cities, writing and technology He has worked with craftspeople in both Pakistan and India to replicate ancient pottery, jewelry and other objects.